A full-time carer for her husband Rod, Lynn McGregor shares the knowledge she’s gained about dementia with others to help reduce stigma. Lynn McGregor knew little about dementia until her husband Rod was diagnosed with younger onset dementia in 2015. Since then, she has been driven to learn as much as she can about living with the condition. “I’m an advocate for dementia because of my husband. I knew a little about the condition before he was diagnosed, but not nearly enough,” she says. 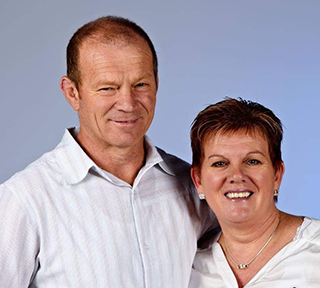 Lynn and Rod took part in Dementia Australia’s National Younger Onset Dementia Key Worker Program, which delivers individualised services and support for people living with younger onset dementia, their families and carers. The program provided Rod with weekly support groups that he could attend, while also offering important support and counselling for Lynn. Lynn helps others understand dementia by sharing her knowledge with as many people as she can. “There is still so much stigma attached to dementia and many people just don’t know what to do,” she says. The biggest challenge Lynn has faced personally is isolation and loneliness. “People say they are there for you, but in reality they are not. Family and friends have the best intentions, but most of the time we are doing this alone,” she says. “We do have some occasional support from family and for that I am eternally grateful. More help, particularly financially, for carers would also go a long way to improving our lives”. Dementia Advocates give a voice to people living with dementia and their carers. If you would like to be a Dementia Advocate, contact the Consumer Engagement Team or visit the Dementia Australia website.